If you answered yes to any of these questions it sounds like you may be ready for a backyard makeover. Start by thinking through the main landscaping considerations, such as the desired purpose of your backyard, the people and pets that will use it and how climate will impact your enjoyment of the space. Watch this video and save thousands of dollars by getting your patio right the first time. This backyard was stuck in the '80s. It featured exposed aggregate concrete with brick bands. 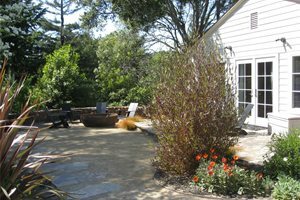 The concrete had settled in areas, so the patio was demolished and replaced with sand-washed, beige-colored concrete with bluestone bands. A fountain was also added with dry-laid flagstone surrounding it. To connect the patio with the new pool, a pattern of random concrete rectangles were poured. A common backyard mistake is making the patio too small. When working on a backyard makeover consider enlarging patio areas to accommodate larger furniture and provide walk around space. 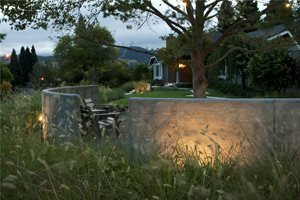 According to landscape designer Maureen Gilmer, "To err is human, but it is better to do so on the side of overly large than too small (check out more common landscape design mistakes)." Ordinary grey concrete can be quite boring. Giving your backyard paving a makeover will transform the feel of the whole yard. When redoing paving you have two options: tear out the existing pavement or dress up what you have. One option, seen in the video at right, is staining and engraving the concrete to look like natural stone. Opting to dress up your existing paving will save you money on materials and labor. Check out all your backyard paving options. Narrow lots can pose a challenge and often end up going unused. However, by working with a landscape designer or architect, you can turn a narrow space into a useable backyard fully equipped for outdoor living. Creative layouts and space saving techniques can be used to fit more features into a small or oddly shaped backyard than you realize. Redoing your backyard can be a big project for a do-it-yourselfer. Demolition and installation of new hardscaping can be back-breaking work that takes the average homeowner weeks to complete, while a professional crew can have it done in a few days. Additionally, projects that involve running water, gas or electric lines can be complicated. If you want a fountain, built-in grill or lots of lighting it is best to hire a licensed professional. However, if you are looking for a DIY option that will save you some money, consider doing the planting yourself. If you go this route, make sure you know the requirements of each plant so you can pick the best location. Pro Tip: When renovating a backyard it is important to consider what existing elements you would like to preserve and communicate that to your designer.